carVertical, as a car history reports business, is interested in both B2B and B2C markets. In order to strengthen our token and the relationship with the consumers and partners, we've create two staking mechanisms. As well as fiat-to-cV token conversion and token burn model, staking should help us to realize the same vision — increase volume and token demand, decrease token supply and other aspects. In a few words, staking is when you have to deposit a certain number of tokens for a certain period of time to receive additional value. First and foremost, the biggest goal is to create positive and long term connection with our consumers and partners. We want to establish a WIN-WIN situation when both sides feels happy about collaboration and that leads to the token prosperity. Depositing a certain amount of cV tokens can generate our clients up to 20% discount for a report. For example, in Lithuania at the moment it would be 3 Eur for each report! Imagine how much you could save if you needed 5 reports every month, for instance? Moreover, the idea behind staking is to decrease the availability of tokens in the market, so that they become rare and couldn’t be sold in exchanges. If you look from macroeconomics perspective, having the same demand but a lowered supply should increase the price. 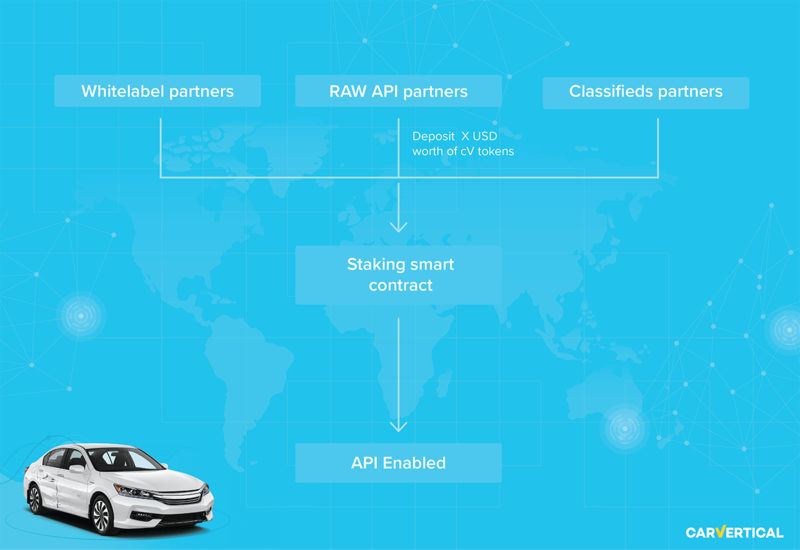 Finally, staking is a message to our Classifieds, RAW API, Whitelabel and other partners. By receiving commitment from their side, we understand that the relationship is serious and that the other party is interested in working with us. This ensures we don’t waste time with empty inquiries which lead to nothing. Both parties can lose the stake if they don’t follow terms that were set in the contract. NOTE: The amount to stake and the percentage discount to receive is subject to change, and most probably will change after being deployed to see how the market reacts. In very simple terms, this staking mechanism is focused towards consumers who buy reports in large quantities. 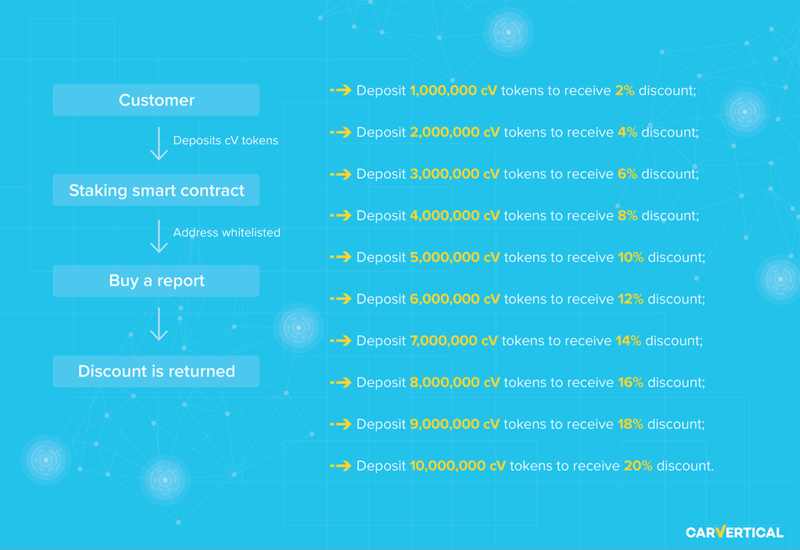 The discount ranges from 2% to 20% and one must deposit at least 1 million cV tokens to receive reports with discount. Once the user buys report in cV, discount is returned to the same address from which the payment was made after X days (or at the end of every month). After you purchase a report, our staking smart contract holds your funds (stake) for a minimum of 1 month, only then can a customer withdraw the tokens. We don’t touch any of the staked tokens, so the customer receives exactly the same amount of tokens he has sent to the smart contract. The biggest reason for implementing this mechanism was the fact that we believe it will greatly incentivise B2C customers to stake their tokens for a discount. In a nutshell, we plan to allow our partners to use our API only when they deposit X USD (which varies based on multiple factors for a partner) worth of cV tokens in the smart contract. This would be legally binding with documents prepared by our lawyers. If the user decides that he no longer needs to use our API, he can exit the smart contract and receive his cV tokens back. We’ve tested these staking mechanisms and the next logical step for us is to apply it to the market. If these staking mechanisms fail, carVertical may cancel, alter or introduce new ones to our products. These two staking mechanisms are currently being tested and will be deployed within the next few weeks. 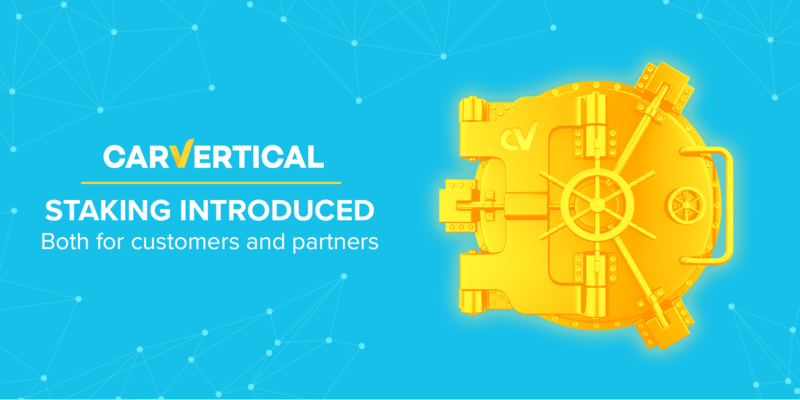 Subscribe to our newsletter and follow us on Telegram/Twitter to get the latest information about carVertical staking mechanism and other hottest news.